Welcome to Sunday Sermon this week, we are 3/4 of our way through this baptism series and today we are looking at what it means to be buried with Christ. Again, the same as last week, I pray that you enjoy, are challenged and encouraged on your journey to or with Jesus our King. Now over the last few weeks we have been looking at Baptism. We’ve been looking at what it is, what it represents, and why it is an important act for those who have are Christians. I was actually reading this week a bit about baptism on a few blog sites. And what I found interesting was the Baptism in the 300 years of the Church was tied to someone directly becoming a Christian. So if you became a Christian, at that point you were baptized. So the conversion experience and baptism were tied together and weren’t separated. However things have changed, and 18 centuries later, the sinners prayer has taken the place of baptism. We now know when someone becomes a Christian, not because they’ve been baptized, but because they’ve said the sinners prayer. And so what this has meant is that Baptism has been replaced, and because it’s been replaced, it’s lost it’s importance and significance. So let’s do our best to bring it back into the spotlight and bring it back to it’s place of significance. 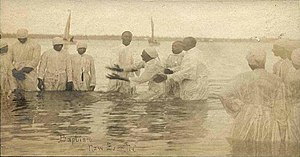 Firstly Baptism is a physical, tangible, act of a spiritual reality. Those of us who have been baptized are telling the world that we belong to Jesus and that we have given him our allegiance. Hence as we’ve just heard baptism was the mark of conversion. So for people who became Christians in the Apostle Paul’s day, baptism was something you did at the point of conversion. This aspect of baptism is important, because especially in a Baptist Church, baptism is a requirement of membership. And to clarify, Baptism is not a requirement in and of it’s self, it is a requirement because it points to the fact that you are a follower of Jesus and have given your life to him. Baptism can’t do that but it points to that. Secondly Baptism demonstrates the Gospel. As we go under the water we profess that Jesus died for the forgiveness of sins, and as we come up we profess that Jesus has risen and by Jesus rising we who have believed in him are given new life. Also on this point baptism does present the gospel, that Jesus died and was raised again, but it also is more than that. It is good news for the person being baptized as well. Jesus has died, he’s died for me, and Jesus has been raised, he’s been raised to give new life to me. So baptism does point to the Gospel for everyone, but it also points to the gospel made reality for the individual being baptized. Another point of Baptism, that we heard about two weeks ago, is that baptism is a way of recognizing the fact that when we become Christians we share in the death of Jesus. As we are put under the water we enact our death to our old life that we lived before we followed Jesus. When we are put under the water we tell everyone that we have died to our old way of life, that we’ve put to death our old nature of sin so we can share in the new nature of the spirit and new life. Now does this mean that we will never ever sin again? No of course not. Because as we read in the scriptures dying with Christ is bot an immediate act but also a life long commitment. Because of Jesus’ death and his grace, when we became a Christian we died to sin. Now this means we are no longer under the curse of sin, we are now assured of eternal life, but as we live this Christian life, and I’m sure we all can attest to this, sin is still a reality, and it will continue to be right up to when we die. And so we are always faced with a choice, “Am I going to let sin get a grip of me again, or am I going to put to death my old ways. So again baptism represents dying with Christ both as a past event and as a constant conscious decision not to let sin win. Now this week we are looking at the second aspect of Baptism. And as we begin to look at this second aspect let’s read our key passage that we’ve been using over the last few weeks. So the first aspect of Baptism that we looked at was being baptized into Jesus’ death. And so the second aspect that we are looking at today is found in verse four. “We are therefore buried with Christ…” And so today we’re looking at what it means to be buried with Christ. In a book I’m reading at the moment, there is this quite humorous story the author tells about baptism services that he attended when he was a kid, let me read it to you. “Even though I grew up in a Baptist church, baptism was the strangest thing I ever saw. The thought of someone shoving me underwater was frightful. Then to see the baptized brought back to the surface, coughing, sputtering and wiping their eyes made me question the whole process. What was all of this about? Why did adults submit to this torturous rite? At the same time it was quite an entertaining event, especially in the 1960s. When my friends and I would hear the announcement, “we’re going to have a baptismal service tonight,” we giggled with delight knowing that “Church” was going to be different. When the time came the pastor always entered the water fully clothed (shirt and tie! ), wearing a white robe. To a boy and his friends, seeing a grown-up “swimming” in street-clothes was especially bizarre. Then, one by one, the candidates–also donning white robes–stepped into the baptistery. The robes would often balloon as they waded into the water, forcing a modest woman to nearly re-create the notorious image of Marilyn Monroe holding down her dress. If she were wearing the high-class beehive hairdo, then we cackled with great anticipation to see which way her hair would flop when she was brought up from the water. Sometimes there was great resistance, a fearful candidate wrestling with the pastor trying to keep their head above water. Every now and then a leg would surface as if the baptized were signaling for help. “As entertaining as baptisms were to a grade-school boy, I was always struck by the seriousness of the ritual when our pastor said, “Buried with Christ,” and placed the candidates under water, eyes closed and arms crossed over their chest like a corpse. Now, I’m sure you’ve seen on TV, the numerous, endless amount of adds for all the different funeral plans that are available. Plans that cost this much, plans that cost that much, plans that will throw in a new TV, and all the rest. And maybe you have even thought that it might be a good idea to think about, maybe you’re putting away money right now. But the truth of it all is this; no matter how much planning you do for your funeral, no matter how much you put aside for it, you will never be able to witness it, and you will never be able to make sure everything is going according to plan. You will never be able to make sure that the right songs get played and that your family knows where you want to be buried or if you want to be buried or cremated. It is simply not something we can do ourselves, at the end of the day, no matter how much planning we have done, we have to trust those we love to take care of us. Dead people rely on the living to take care of their bodies for proper burial. At that point the dead have nothing to say. They are entrusted to the care of their family. In the same way the baptized lean into the arms of the Church. Placed under water, believers are buried with Christ, entrusted to the care of their new family–to bring them out of the water and to a new way of living. So, just like you trust your family to take care of you when you die, when you are baptized and buried with Christ, you entrust your new family with your care. This family of believers called the Church. Now being buried with Christ flies in the face of this common notion that all I need for my spiritual growth is Jesus. No sire, We need our reliance on Jesus is expressed in our need for each other. And baptism, and burial with Christ tells the world, and in this case our church family, that hey, I need you guys, and that I’m trusting you to look after me. Baptism, and our burial, is a covenant making activity. As we are put under the church family witnessing the act, is reminded of their duty to look after the one being baptized and visa-versa. This commitment and trust that we have to and in each other as symbolized in baptism was so important that every time bar-one Paul brings up Baptism when talking about Church Unity. In a sense, Paul was saying, “your finding it hard to get along, you’ve got factions amongst you, well then let me remind you that you have died with Christ and were buried with him. You have made a commitment to each other to put your needs below the needs of others, your care now is for each other, not your self. Paul believed that when you were baptized you were baptized into a family of believers, believers that are dead to themselves and alive to God. Believers that have made a commitment not only to God but to each other. This is why Paul reminded them – You have been baptized into the family now get along! When we witness a baptism we should be reminded of the commitment we have made to each other, and the commitment we are now making to the one who is being baptized. Finally before we close in prayer and sing our final song, Again I want to put the invitation out, if you have not been baptized would like to be please speak to me. Also being baptized and membership into a local church are closely liked, so much so that In my old church when I was baptized I was handed my certificate of membership. So If you are baptized and are not yet a member I would encourage you to explore this path, and again come and speak to me.